Photo Gallery is a work in progress. Stay tuned - as you just might see yourself in pictures. Click on photo to enlarge for a better view and more details and scroll through the pictures clicking on the arrows on the left or right side. 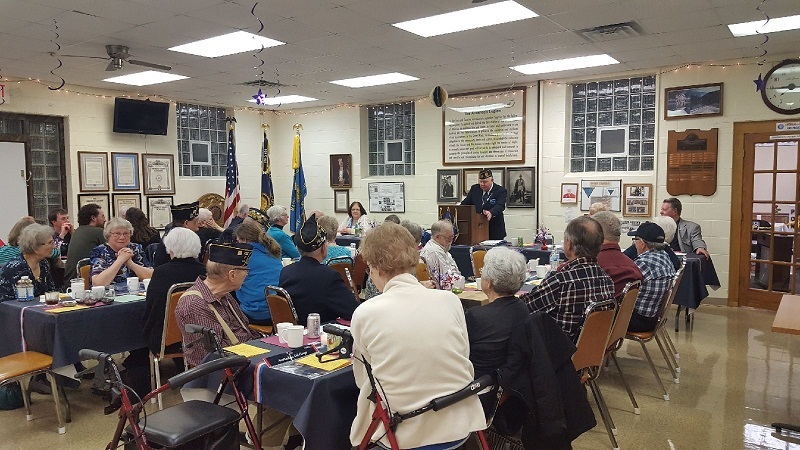 A full house at Post 501's members meeting on 4-10-2019. Cdr. Thomas Stolarczyk presents a 10 year membership award to Benito on 4-10-2019. 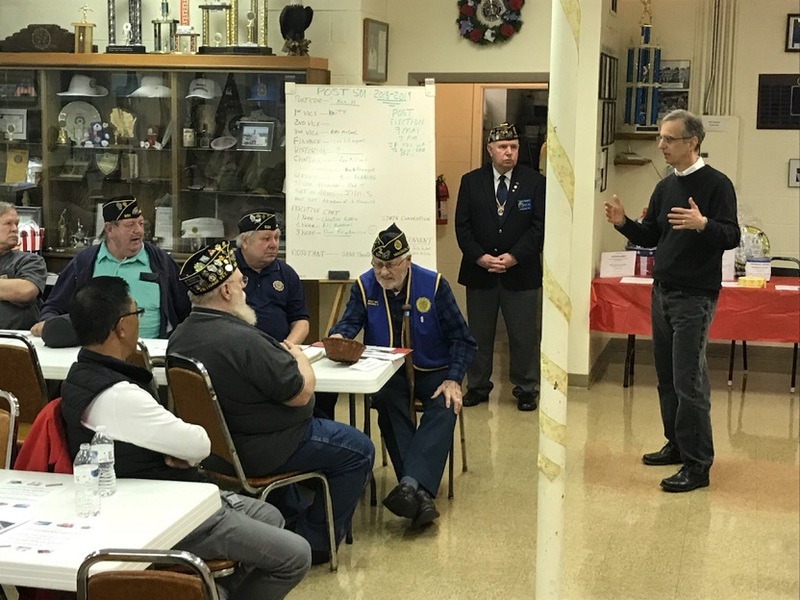 Legionnaire Robbins sharing with members the benefits of visiting other Legion Posts while on vacation, 4/10/2019. 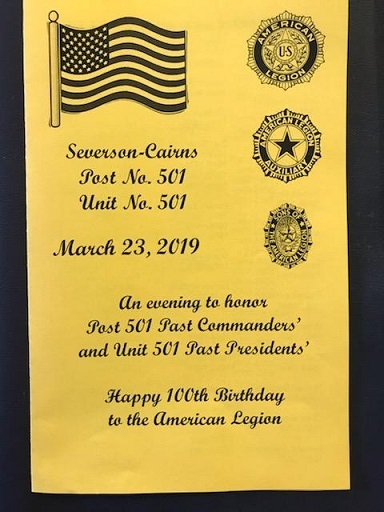 Post 501’s Celebration Dinner on 3/23/2019 in honor of American Legion’s 100th Birthday and Post 501’s Past Commanders and Unit 501’s Past Presidents. Clubhouse preparations for the March 23rd Birthday Dinner. 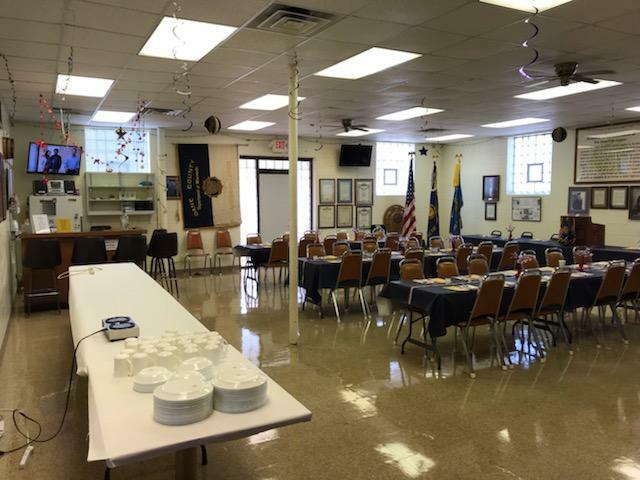 Another view of Post 501's Clubhouse prior to members arriving. 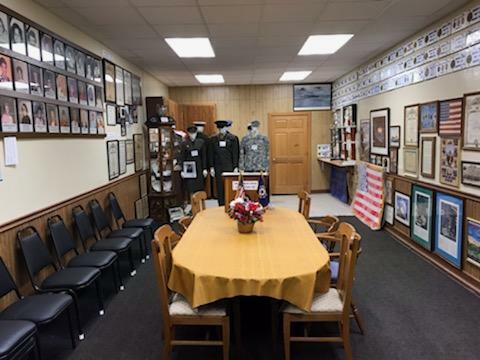 The Post 501 Auxiliary/History Room ready for guests to view. The program for Post 501's Birthday Dinner. A full house for Post 501's Birthday Dinner. Guest speaker, Jan Pulvermacher-Ryan, Past National Auxiliary President. 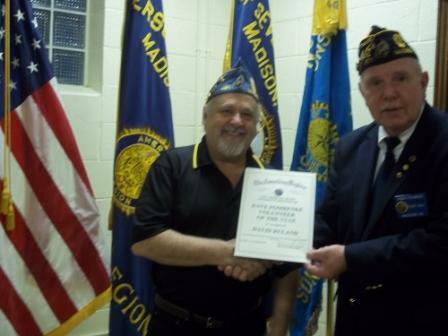 Jerrold Schultz receiving the Legionnaire Of the Year award from Cdr. Thomas Stolarczyk. Cdr. Thomas Stolarczyk presented an outstanding award to Unit 501's President, Rebecca Lovell, for her support and dedication to Post 501. 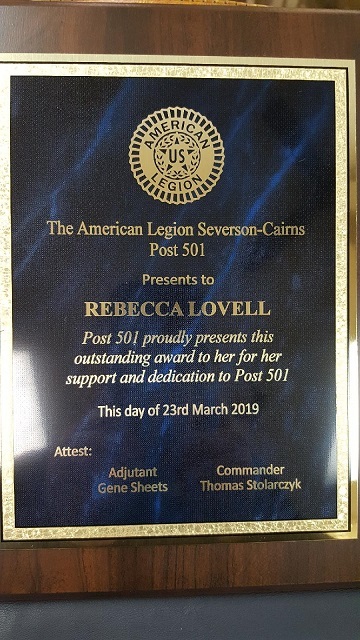 Outstanding Award presented to Unit 501's President, Rebecca Lovell. A full house of Legionnaires attending the March 13th Post 501 meeting. Legionnaire Charlie always appreciate's Post 501's delicious St. Patricks' Day corned beef dinner, 3/9/2019. 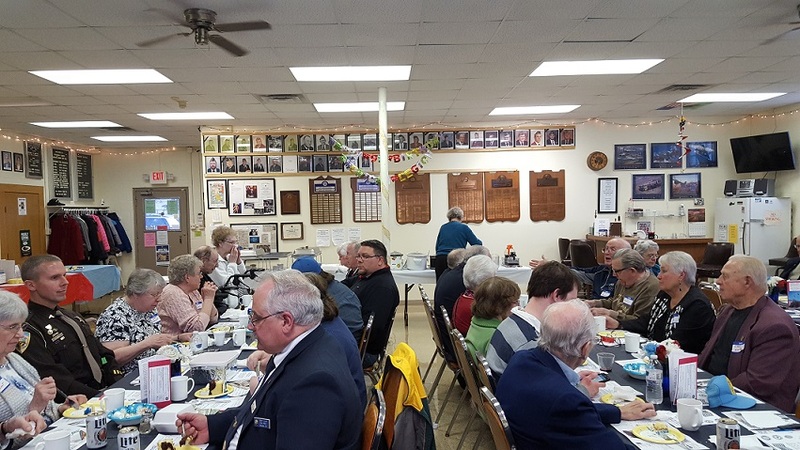 These folks participated at Post 501's corned beef & cabbage dinner on 3/9/2019. 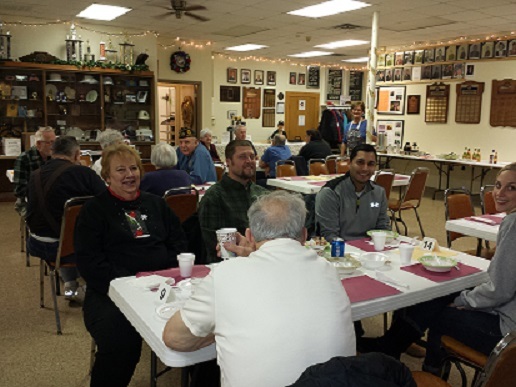 Legionnaire Chris, Post 501's cashier, is all smiles at Post 501's corned beef & cabbage dinner on 3/9/2019. 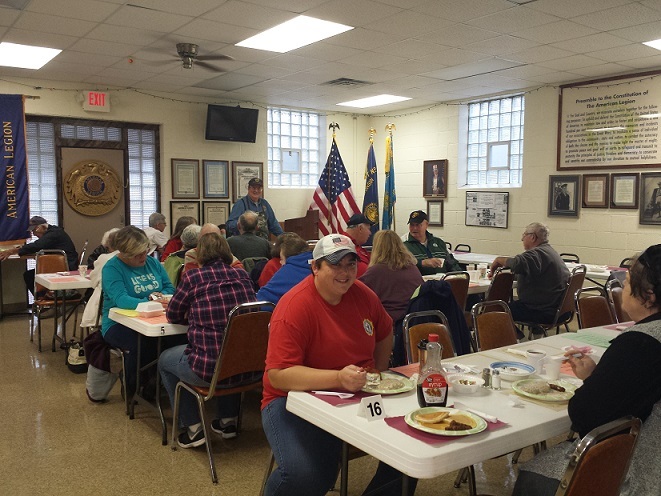 Happy customers at Post 501's breakfast on 3/9/2019. 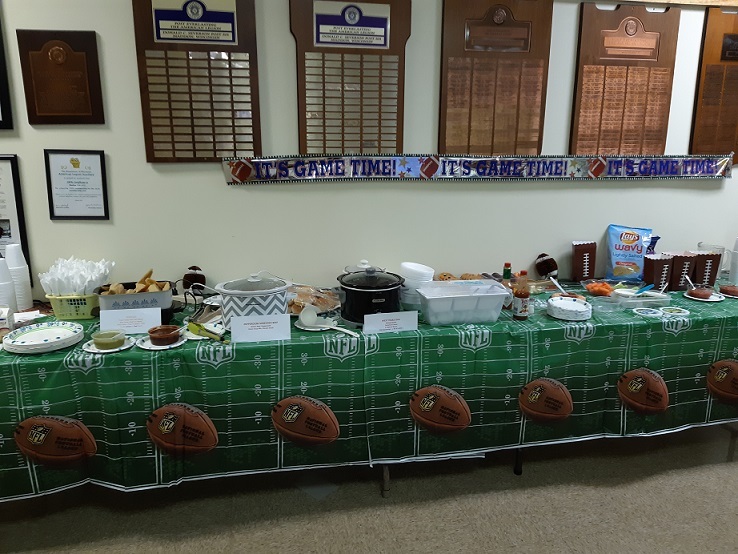 For the third year in a row, the members of Post 501 celebrated Super Bowl Sunday, the most watched sporting program of the year. Even though our favorite team, the Green Bay Packers, did not participate, it was still a great social event of the year. Some folks came just for the food, which was devoured with great pleasure, plenty for all. Others came to play cards and watch the commercials, not caring much about the game itself. Then there were those who participated in trying to foresee the scoring outcomes quarter by quarter. There were door prizes for the lucky few. 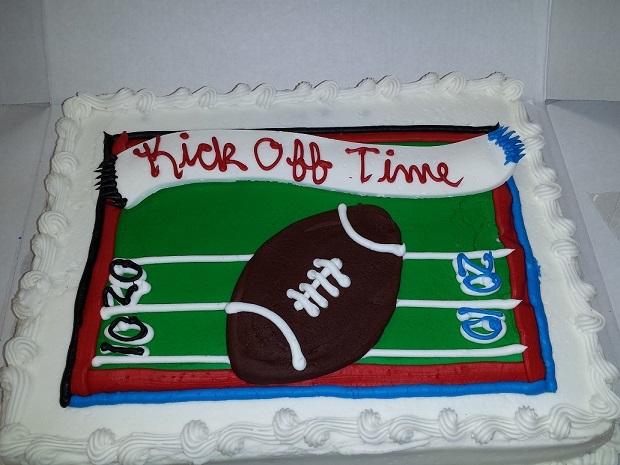 If you didn’t make it this year, put the Super Bowl Party on your calendar for 2020. Here is the Super Bowl buffet, something for everyone. 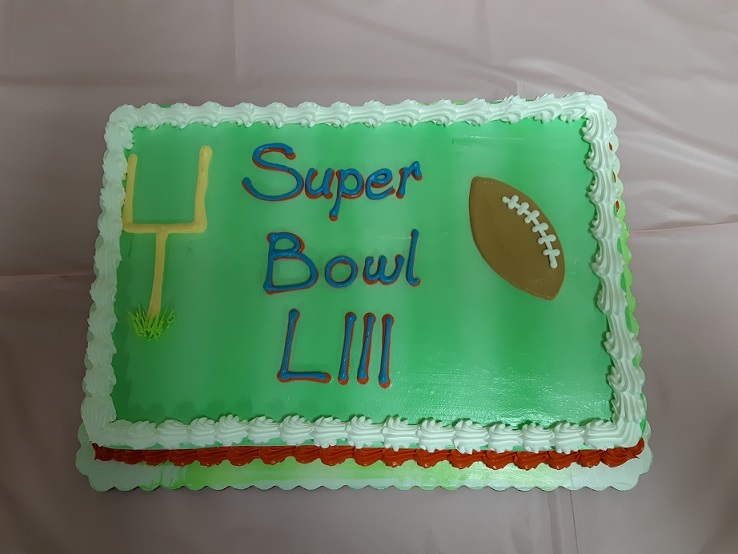 Celebration Super Bowl 53 cake, if Packers were playing team names would be added. Participants enjoying a social occasion on a snowy day. Some just wanted to play cards. 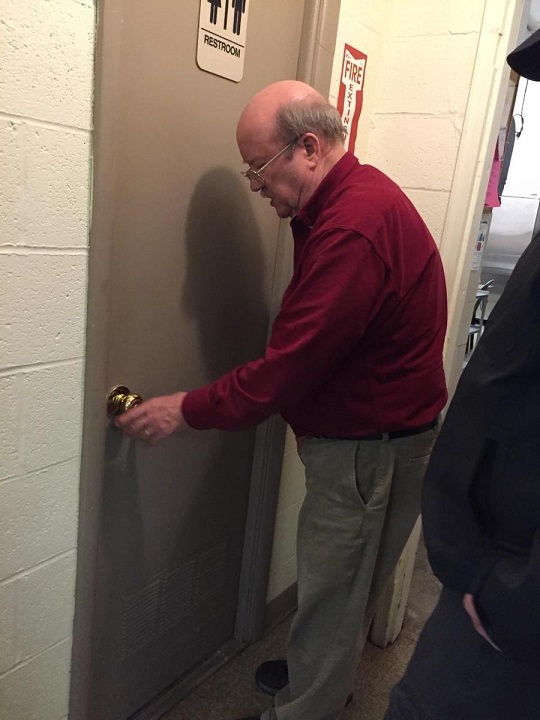 Matt, SAL member, got locked in the restroom. Legionnaire Bill was first to rescue. Now there were two. Mike coming to the rescue of Matt. Then there were three. Keith offered his guidance. Still no luck. Matt is still nervously alive. Now there were four. David and Romeo each provided their thoughts. Finally, Matt was rescued, feeling a bit claustrophobic. It was a total team effort. Post 501's Cdr. Tom & Legionnaire Christine Robbins, welcoming our guests to Cdr. Tom's Chili Dinner at Post 501 on 1/26/2019. 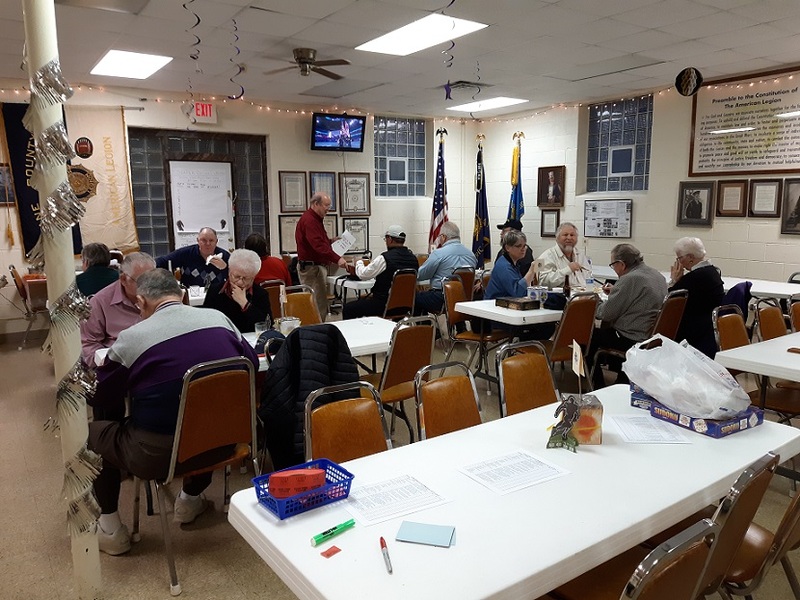 Many guests enjoying Post 501's Chili Dinner on 1/26/2019. Bill, Carol & Colleen enjoying the chili at Post 501's Chili Dinner on 1/26/2019. Tom & Jerry showing off. 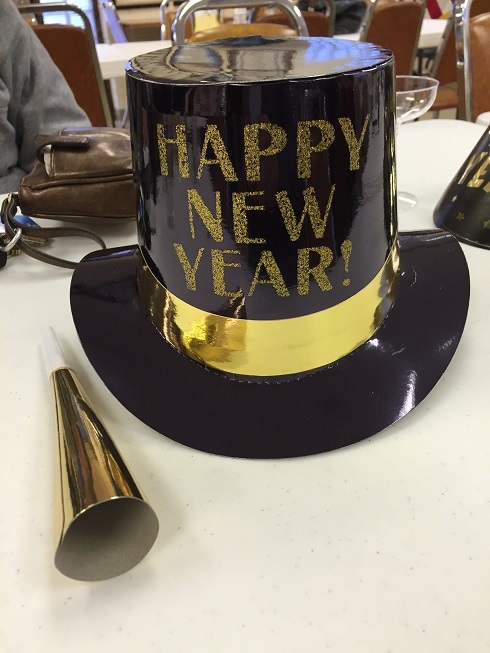 Attendees have a great time at Post 501's New Years Eve Gathering. Fellowship among Legionnaires & Auxiliary. Bill just happy to be present. Rebecca & Colleen - highlights at the party. Dave & Helen looking forward to a great New Year ahead. Good friends, Don & Marge, have said "we're never too old to look to the future". Father, Keith, and daughter, Rebecca, sharing in the change of years. Chris & Bill another year down, what holds for the future? Ken & Nikki, looking forward, planning on the best the new year has to offer. Four new members, Steve Huemmer, Joshua Nichols, Gary Dobbs, Dave Sersch, initiated into Post 501 on 10/10/2018. Presentations by 2018 Badger Boys State attendees representing Madison East & West High Schools, along with parents, on 10/10/2018. 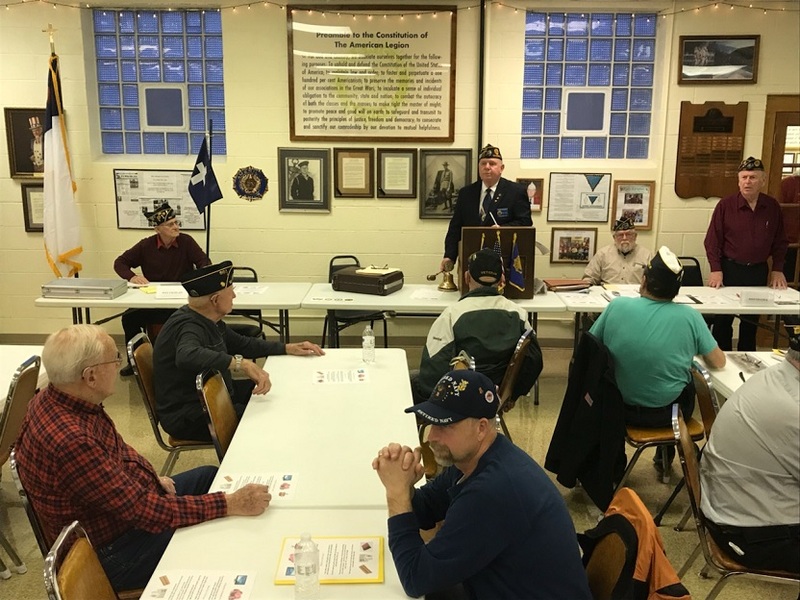 Post 501 member Legion meeting on 10/10/2018. 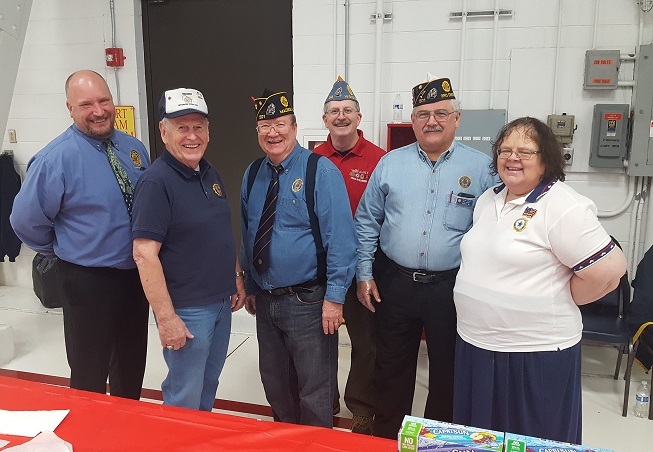 Legion supporters enjoying the Post 501's volunteer appreciation luncheon on 10-7-2018. Legionnaire & Past State Cdr. Bud Mautz receiving a photographic memory of JoAnn Mautz on 9-1-2018. Post 501 Cdr. Thomas Stolarczyk & 3rd District Cdr. Keith Lovell presenting Patrick McEvilly with 50 year certificate. Three new members, Benito Cuevas, John Gaska, & Thomas Nord, initiated into Post 501 on August 8, 2018. Handmade quilts distributed to Post 501's deserving Legionnaires, Bud Mautz, Don Brinkmeier, & John Gaska, on August 8, 2018. Post 501's Legion meeting attendees on 8-8-2018. National Cdr. Denise Rohan and 3rd District Cdr. Keith Lovell in attendance at the Dept. 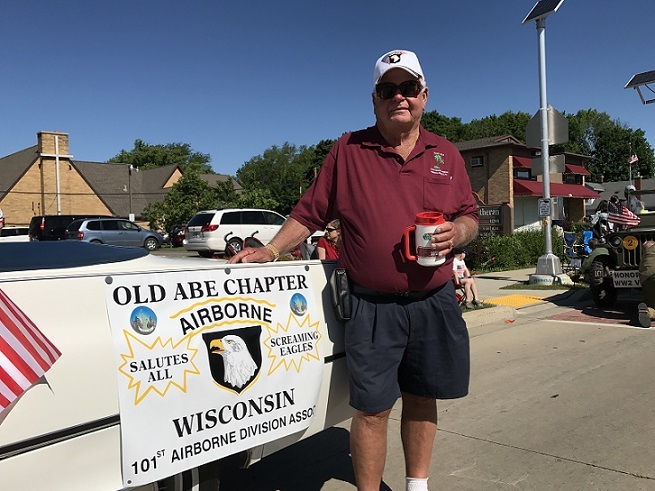 of Wisconsin Annual Convention in Oshkosh, 7-15-2018. Finished side view of Post 501, July 2018. Finished front view of Post 501, July 2018. Legionnaire Romeo applying finishing touches to the painting of Post 501, July 2018. Legion Riders receiving a check from Post 501 for Legacy Scholarship. 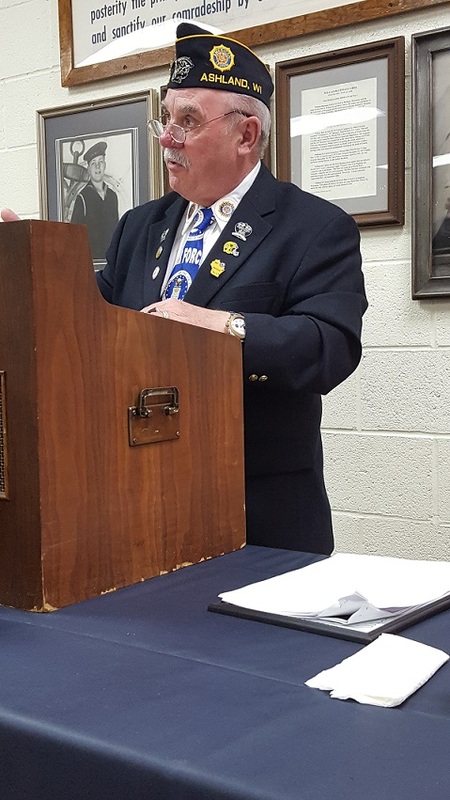 One of our own, newly elected 3rd District Commander, Keith Lovell, addressing the 3rd District American Legion Auxiliary Spring Conference - 4-28-2018. Cdr. Tom Stolarczyk and 3rd District Cdr. Keith Lovell presented the 3rd District Award for Law Enforcement of the Year to Dane County Deputy Jeffery Thiel on 6-15-2018. Post 501 Legion members, Keith Lovell and Rebecca Lovell, attending State Capital Memorial Day Service in Madison on 5-28-2018. 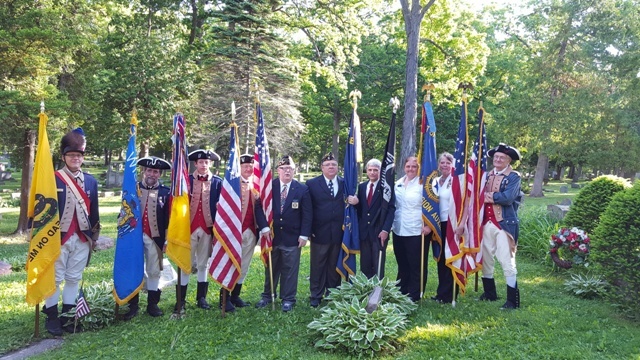 Memorial Day Parade Participants, 5-28-2018. 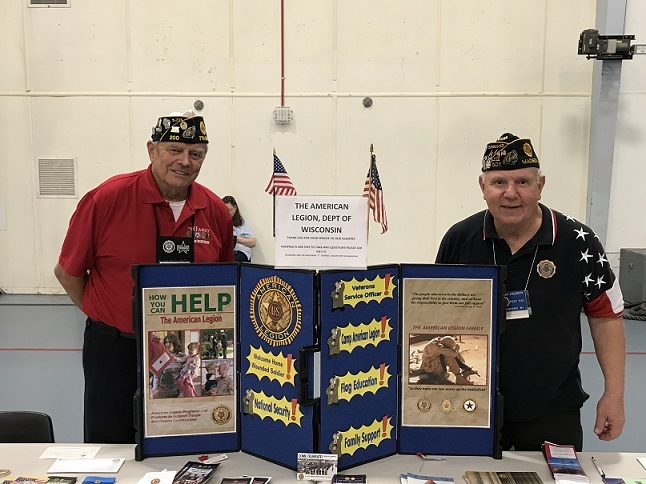 Legionnaires Don Schaefer, Chris Robbins, and William Robbins distributing Poppies at the Veterans Hospital, Middleton, WI, on 5-18-2018. 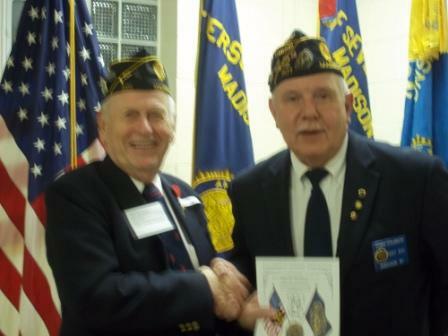 Post 501 Thomas Stolarczyk and 1st Vice Cdr 3rd District, Keith Lovell. 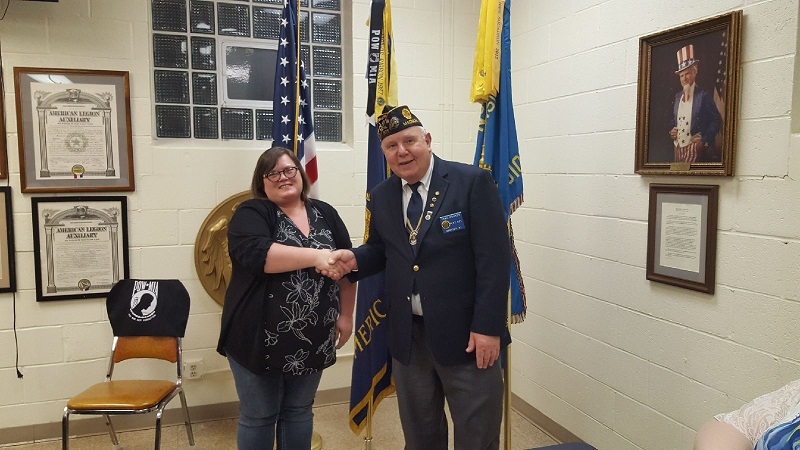 New member initiation for Lisa Kromanaker on 5-9-2018. Post 501 Legionnaires and Auxiliary. Post 501 Cdr Tom Stolarczyk, and SSM Health At Home Volunteer Coordinator, Kim Black, and Medical Social Worker Laura Hall. Cdr. Tom presenting Keith Lovell with his 40 year SAL Membership Award, 3-24-2018. Post 501 Legionnaires & Auxiliary. Dane County Executive, Joe Parisi. 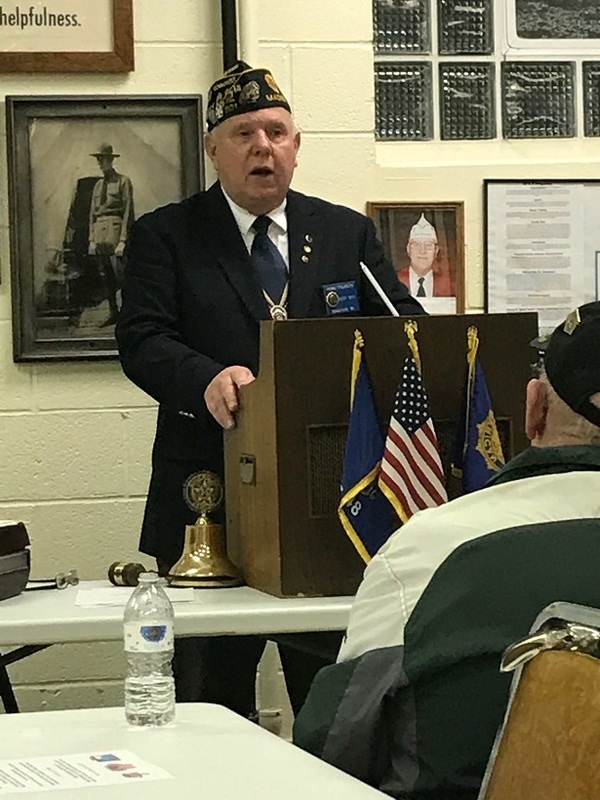 Post 501's Chaplain Ray invocation on 4-11-2018. Post 501 Cdr. Tom taking charge on 4-11-2018. Post 501's new member initiation for Alan Kromanaker on 4-11-2018. Post 501 conduct of member meeting on 4-11-2018. Cdr. Tom presenting Karl Brinkmeier with his 10 year SAL Membership Award, 3-24-2018. Cdr. Tom presenting Deputy Sheriff Jeffrey Thiel Post 501's Law Enforcement Officer of the Year Award, 3-24-2018. 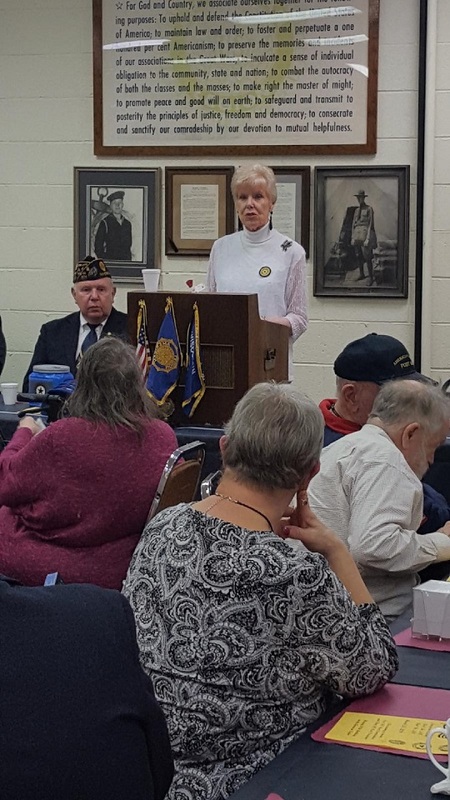 Auxiliary President Rebecca Lovell giving her presentation at the Post 501 Birthday Dinner, 3-24-2018. Auxiliary President Rebecca Lovell presents Nicole Hanson with her 10 year Auxiliary Membership Award, 3-24-2018. Auxiliary President Rebecca Lovell presenting Ellie Paulson with her 20 year Auxiliary Membership Award, 3-24-2018. 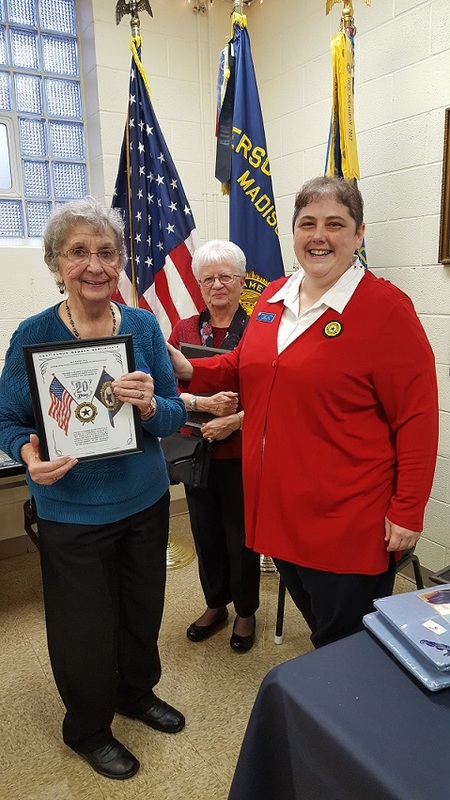 Auxiliary President Rebecca Lovell received her 40th year Auxiliary Membership Award, 3-24-2018. Auxiliary President Rebecca Lovell presents the 45th year Auxiliary Membership Award to Sonia Albright, 3-24-2018. Presentation by guest speaker at the Birthday Dinner was 11th District Cdr. Frank Kostka, 3-24-2018. Cdr. 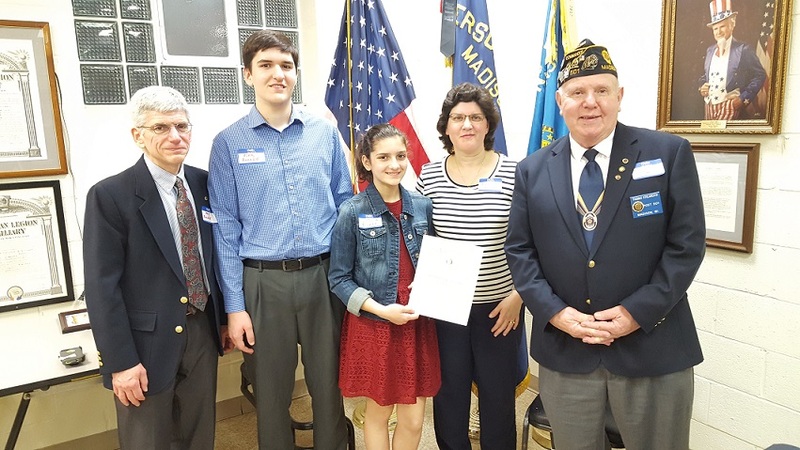 Tom awards Post 501's Volunteer of the Year Award to Victoria Boerke & Family, 3-24-2018. 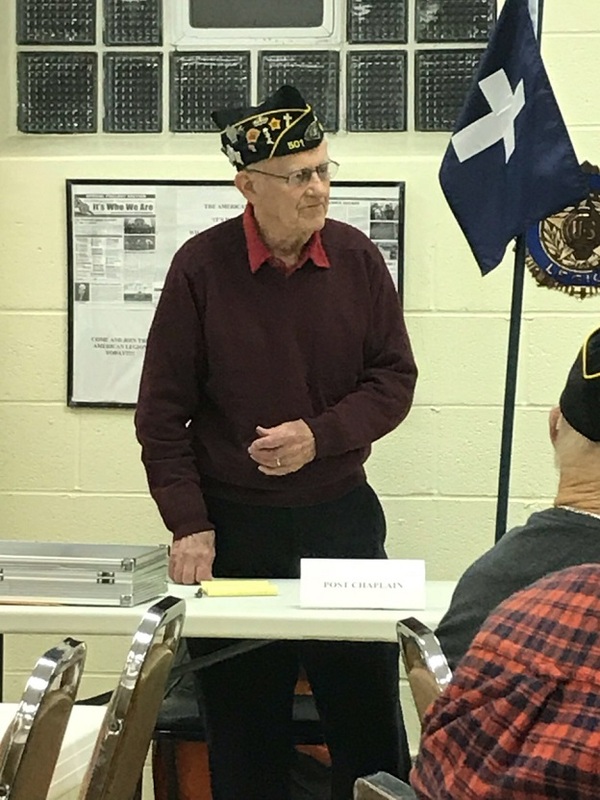 Jim Schuhart presents Post 501's Legionnaire of the Year to Gene Sheets, 3-24-2018. 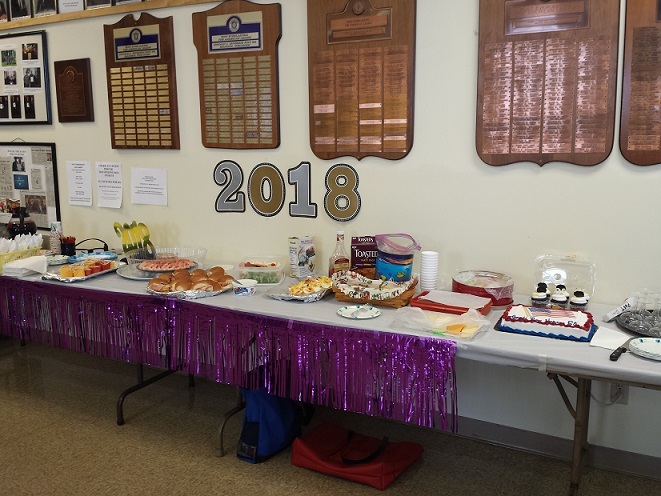 Special cake provided in celebration of Post 501's birthday, 3-24-2018. General membership enjoying Post 501's Birthday Dinner and Award Presentations on 3/24/2018. General membership enjoying Post 501's Birthday Dinner & Awards Presentations on 3-24-2018. 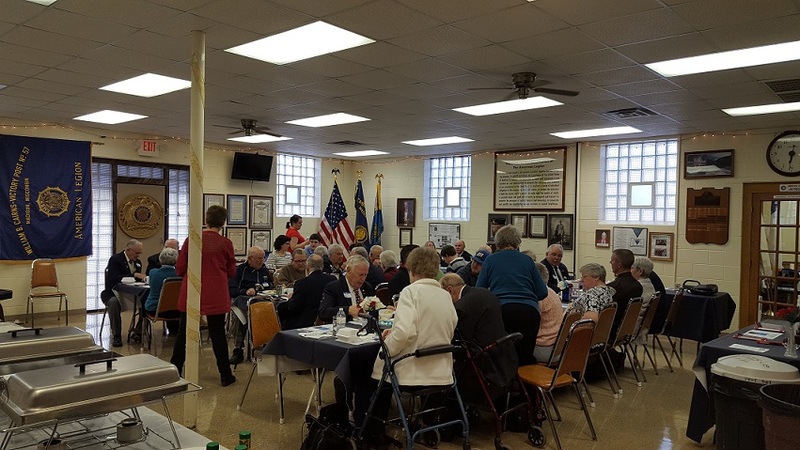 Participants at Post 501's Corned Beef Dinner enjoyed a delicious meal on 3/10/2018. Mary & Cdr. Tom celebrating arrival of 2018. Members & friends enjoying benefits the years bring. Carol & Don celebrating the New Year. Even children joined the celebration. A bountiful spread for the New Year. What is a New Year's celebration without a cake! 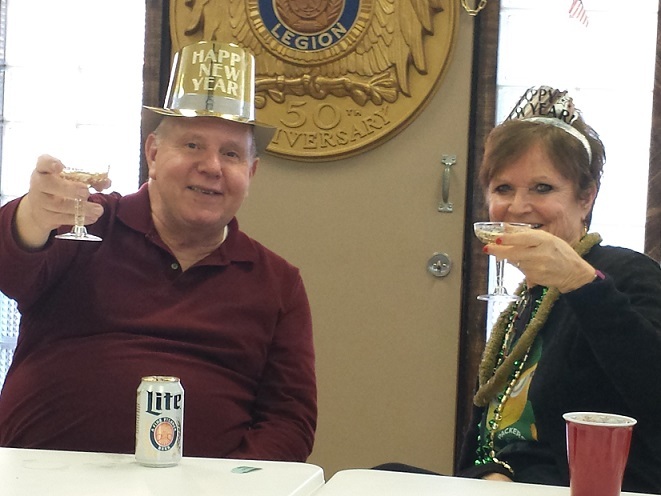 Happy New Year celebration at Legion Post 501, 12/31//2017. Unit 501 Auxiliary members making & filling stockings for Veterans at Madison VA, December 2017. Veteran Service at Oak Park Place on 11/10/2017. 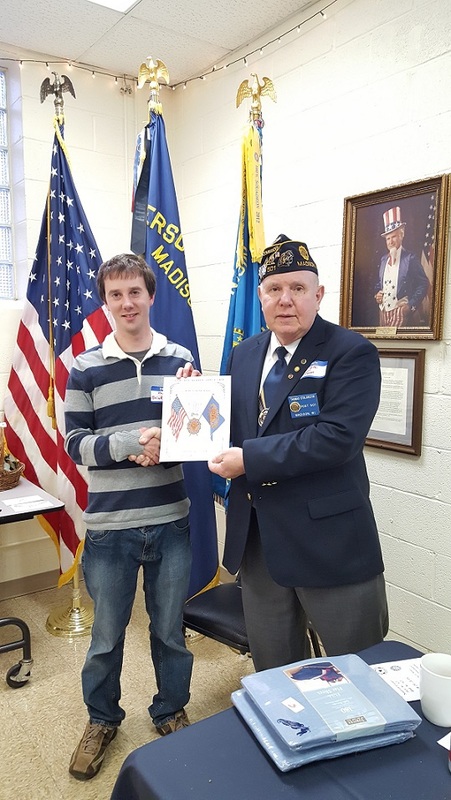 Post 501 members: Eric Beuermann, William Robbins, Post Cdr. Thomas Stolarczyk, Unit 501 Auxiliary President Rebecca Lovell. 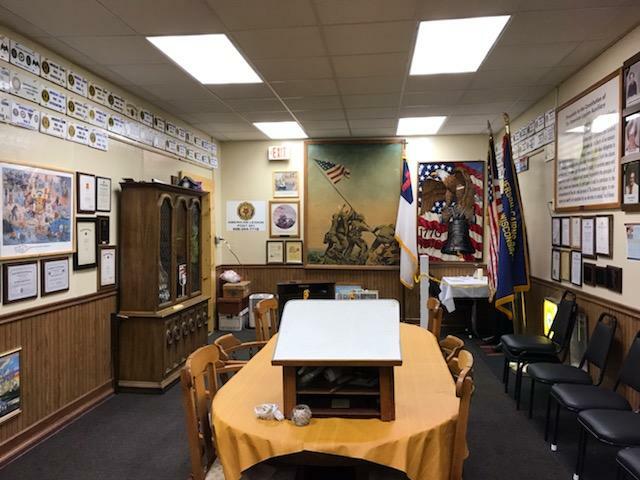 Post 501 New Member Welcome & Initiation, 11/8/2017. Cake served at Past Commander's Dinner at Post 501 on 11-4-2017. Past Commander's Dinner at Post 501 on 11-4-2017. Post 501 Commander Thomas Stolarczyk and WI Department Commander Laurel M. Clewell at Membership Revitalization held at Post 501, 10-20-2017. Post 501 Monthly Breakfast on 10-14-2017. Outside view of garage sale items at Post 501, 9/22-23/2017. Items setup in the History / Auxiliary Mtg. room for garage sale at Post 501 on 9/22-23/2017. Setup for garage sale & book sale at Post 501, 9/22-23/2017. Setup for Post 501's garage sale & book sale in Legion hall on 9/22-23/2017. Christina, Keith, Rich, Rebecca, Betty & Phil, at American Legion National Convention, Reno, NV, 8-24-2017. Denise Rohan, National Commander and Unit 501 President, Rebecca Lovell, 8-24-2017. The Lovell family congratulating Denise Rohan on her election to National Commander, 8-24-2017. Denise H. Rohan Elected National Commander for 2017-18, at American Legion Nat'l Convention, Reno, NV, 8-24-2017. 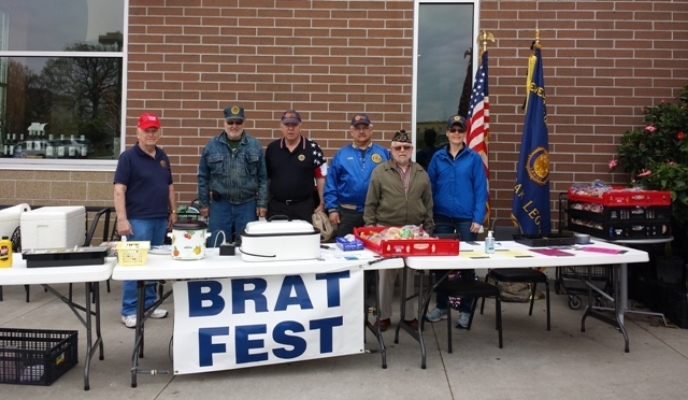 American Legion Auxiliary Nat'l. Convention, Diane Duscheck from WI, newly elected ALA National President, 8-23-2017. American Legion Auxiliary Convention Meeting, Reno, NV, 8-21-2017. American Legion National Convention Parade, Reno, NV, 8-20-2017. Cdr. Tom Stolarczyk presenting Mary Hanson Post 501's 2016 Volunteer of the Year Award. Post 501 Legionnaires support the arrival of the Project Hero veteran bikers to Madison on 8/10/2017. Post 501 Members meeting on 8/9/2017. 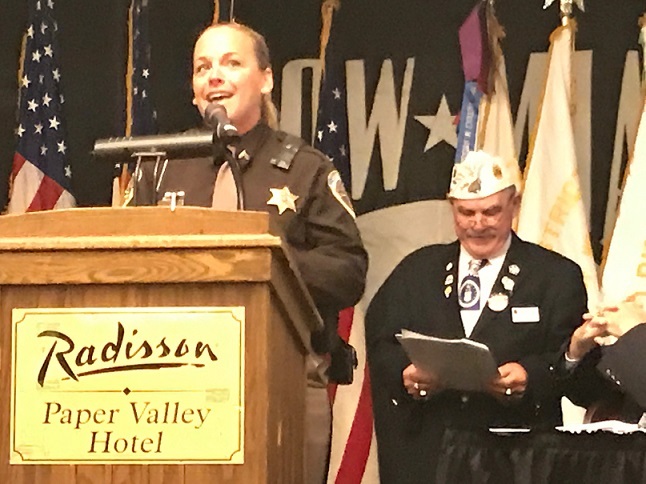 Dane County Deputy Sheriff, Josalyn Longley, upon receiving the WI Law Enforcement Officer of the Year for 2017, speaking at the WI American Legion 2017 Convention, 7/15/2017. 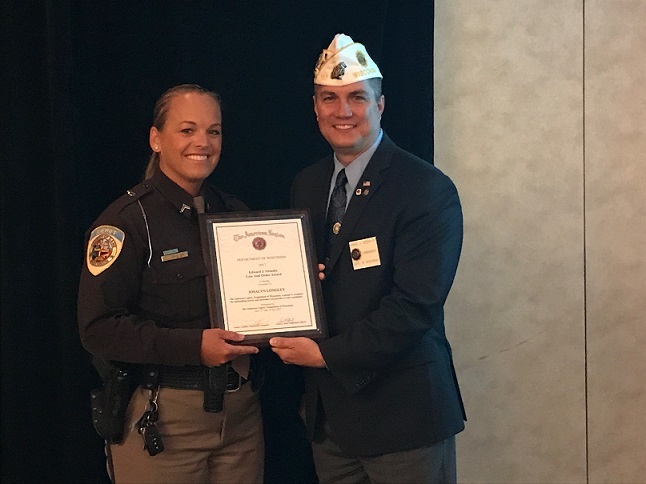 Deputy Longley receiving her citation award from WI American Legion Cdr. Dan Seehafer, 7/15/2017. 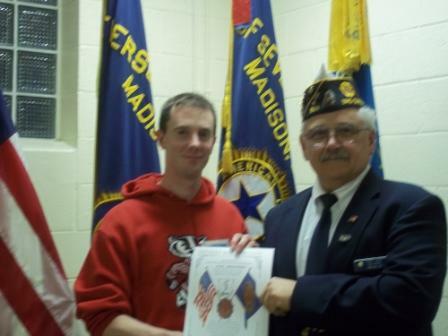 Deputy Longley was sponsored by American Legion Post 501, Madison, WI. Dane County Sheriff, Cpt. Tueschur, & Post 501 Cdr. Tom Stolarczyk, proudly stand beside, 7/15/2017. Post 501 participates in Memorial Day Parade, Monona, WI on 5-29-2017, Cdr. Tom Stolarczyk, Legionnaires: Jim Schuhart, Arne Dahl, & Charlie Powers in Monona, WI. 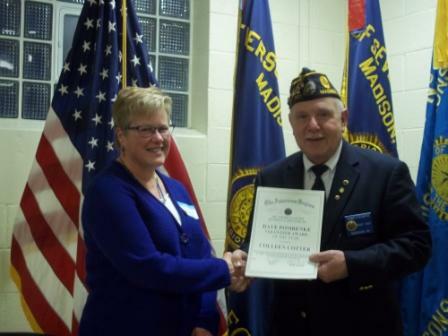 Legionnaire Christine Robbins awarded the 2017 "Legionnaire Of The Year" by Post 501's Cdr. Thomas Stolarczyk, 5/10/2017. Friends enjoying a corned beef dinner at Post 501 on 3/11/2017. Legion supporter enjoying a corned beef dinner at Post 501 on 3/11/2017. Post 501's Legionnaires remember a deceased member, 2/24/2017. Least favorite team won, participants' thoughts, 2/5/2017. Keeping score at Post 501's Super Bowl Party, 2/5/2017. Lucky participants at Post 501's Super Bowl Party, 2/5/2017. The Chief is a lucky winner at Post 501's Super Bowl Party, 2/5/2017. 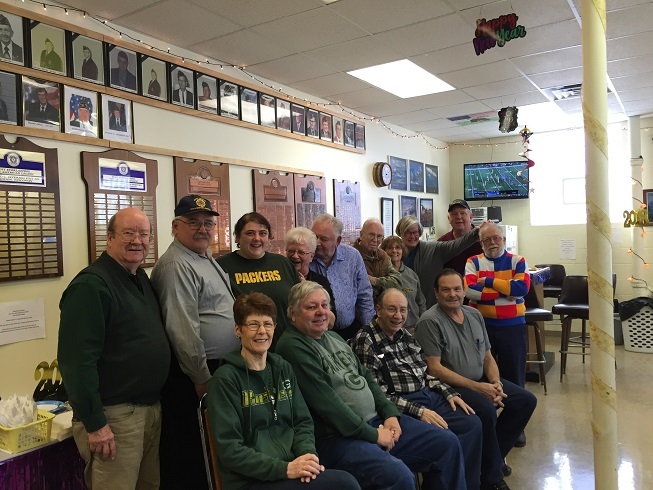 Participants in Post 501's Super Bowl Party, 2/5/2017. Legionnaires enjoying Post 501's Super Bowl Party, 2/5/2017. Welcome Post 501 Super Bowl Party on 2/5/2017. Keith & Phil enjoying Cdr. Tom's Chili Dinner on 1/14/2017. Good attendance at Cdr. Tom's Chili Dinner on 1/14/2017. 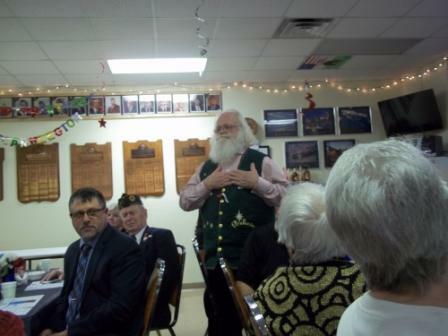 American Legion in support of the 115 TFW WI Air Nat'l Guard Christmas Party on 12-4-2016. Post Cdr. 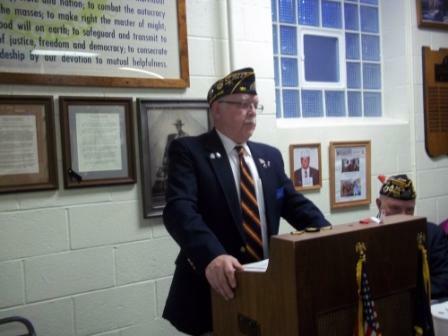 Tom Stolarczyk presenting to Denise Rohan at the Dane Cty Council Mtg, 12-1-2016, in support of her campaign for American Legion Nat'l Cdr. Post Cdr. Tom Stolarczyk, presenting Post 501 Legion Award to Tim Smith, Mgr. Metro Mkt., for their support during 2016 fundraising, Finance Off. Phil Ingwell assisting. Presentation on Nov. 29, 2016, by Post 501 to Secretary John Scocos, retirement from WI Dept. 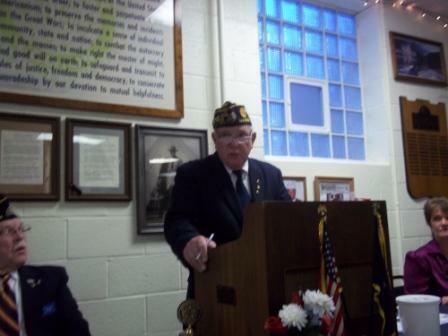 of VA, for his long-term service to the American Legion. 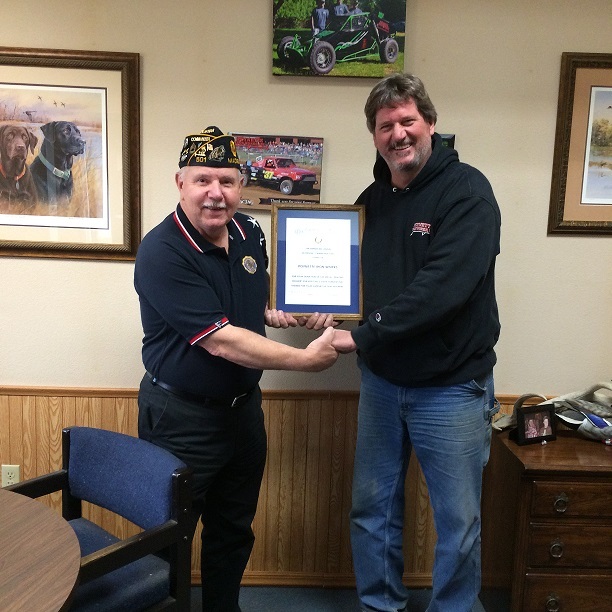 Post Cdr Tom Stolarczyk presents Post 501 Legion certificate to Guy Semkowski, owner of Poynette Iron Works for Kneeling Prayer Soldier metal siloutte donated for 2016 State Convention. Presentations at Post 501 on 10-12-2016 by youths who attended Badger Boys State. Veterans Day ceremony at Oak Place, Madison, WI, 11-11-2016. Post 501 Legionnaires are assisting in the ceremony. Post 501 Cdr. Tom Stolarczyk & Bill Robbins presenting poppies to the Deerfield High School Veterans Day Program on 11-9-2016. Overseeing the program are Maria Furguson & Elizabeth Johnson. 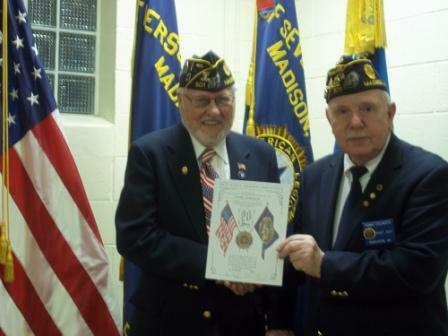 Ray McCool, Post 501 Chaplain, receiving recognition on 9/14/2016 for his service to Badger Boys State; presented by Past WI State Cdr., Bud Mautz, also of Post 501.